Cost of solar panels in Edmonton, Calgary and Alberta. The million dollar question everyone wants to know - what do solar panels cost? The cost of installing solar panels on your home or business will depend on many factors, such as your desired capacity (how many modules you want), your location, and your existing electrical infrastructure to name a few. Each of which will greatly affect the long-term economics of solar power. Installing solar panels in Edmonton, Calgary, or anywhere in Western/Northern Canada is incredibly viable and cost effective. The cost of solar panels in Alberta and Canada has seen dramatic decreases in recent years. More effective installation techniques, government incentives, and technological innovations steadily drive the price of solar panels down. Kuby Energy does not offer standard 'packages' - we design all solar power systems custom to meet you architecture and budget. The best way to learn how much your solar panels will cost is to contact us - we offer free appraisals, and will look for ways to save you money. Everyone's lifestyle, home, and desires are unique so there is no set system cost. 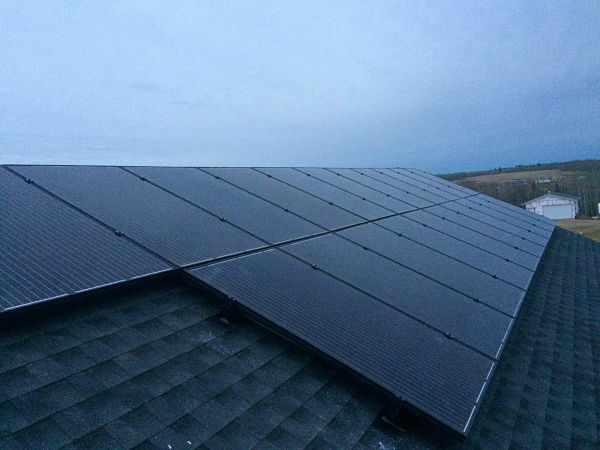 Thankfully, its now more affordable than ever to install solar panels in Alberta. The average cost to install solar panels is roughly $10,000 to $16,000, which will provide all your engineering, material, labour, and permitting. Additionally you may be eligible for solar power rebates and/or system financing, further dropping your investment in solar power. -Commercial solar power installations will receive a $0.75/W up to %500,000 or 25% rebate. This rebate is an incredible opportunity to save thousands of dollars on your solar panels in Edmonton, Calgary or anywhere in Alberta. Learn more on the new Alberta solar power incentive. More solar panel rebates are available to munipalities, indigenous communities, residents of Banff, ACE Power Cooperative clients and businesses in Alberta. New solar power rebates, grants and incentives are constantly being released. Depending on what province you live in, you may be eligible for different rebates. Read the full list of solar power incentives in Canada. Everyone's lifestyle, home, and desires are unique. Because of this, we design every project custom to your needs. Thanks to continuous innovations in the solar energy industry it is now more affordable than ever to install solar panels. Through ATB Financial, you can select from a number of payment options depending on your preference. Contact us now for your free home or business solar panel quote!